The media: Scott is a hero! Scott: It’s really really cold here. Amundsen: It’s not that cold. The media: Scott is a hero. Oh, and Amundsen. Public: Shackleton is a hero, but please shut up, there’s a war on. Geophizzicists: Let’s find out just how cold it is. Media: Scott is a hero! Scientists: It’s colder in some place than others. Scientists: It’s cooling at the South Pole, but warming very fast on the Peninsula. Media: Antarctica is cooling, but warming faster than anywhere else on earth. Thompson and Solomon: Most of Antarctica is cooling in summer, but it is warming on the Peninsula. We think it has to do with the ozone hole. Media: Because of ozone, Antarctica is warming faster than anywhere else on earth and we are all going to die. Scientists: The troposphere over Antarctica is warming significantly in winter. Media: Even though that paper was published in Science, our readers don’t know what the troposphere is. Neither do we. Next? Scientists: The troposphere over Antarctica is warming significantly in winter and spring, especially over West Antarctica. Media: That paper wasn’t published in Nature, so we’re not very interested. Scientists: Antarctica is cooling in fall — not summer — in some places, but warming, especially in winter and spring, especially in West Antarctica. Media: Antarctica stops cooling! Conservative or liberal, we are ALL going to die. Steve McIntyre: The “team” made up the data again. I don’t know what Antarctica is doing, but I think it is probably cooling. Media: Antarctica starts cooling again, global warming is a fraud. Ryan O’Donnell: Our paper in the Journal of Climate shows a somewhat better way to look at the same data. Antarctica is warming a bit more in summer, and a bit less in winter in the Ross Sea region. In fall it is cooling a bit more too, and so the overall trends are smaller. Still, West Antarctica is definitely warming significantly, as Steig et al. found. That’s interesting. Eric Steig: Nice paper Ryan. Thanks for sending along a pre-print. Steve McIntyre: Hey, we got published in the Journal of Climate! Another paper showing that the “team” made up the data again! (Sotto voce): Ryan says it it is warming a bit more in summer, and a bit less in winter in the Ross Sea region. In fall it is cooling a bit more. Otherwise we get the same results, though the magnitude of the trends is smaller. But West Antarctica is still warming significantly. But I really don’t care. The peer review process is broken, which is why.. umm…our paper was published in the leading climate journal. Liberal Media: That paper wasn’t published in Nature, so we’re not very interested. Conservative Media: Antarctica is cooling. Global warming is a fraud. Spot on. I’m particularly impressed at how many outlets described Ryan O’s paper as a “refutation” of yours, when he himself had explicitly advised against it. Unfortunately the paper is still not showing up on J Climate’s website yet. Any info about when we mere mortals will be able to get our dirty paws on it? I read today a claim that in the paper published recently by Dr Steig et al. in Nature regarding the Antarctic warming trend, there is a weighting problem. They claim that most of the weighting comes from the peninsula stations, which represents a relatively small part of the continent. I was wondering if this is in fact the case? It doesn’t seem likely, but could you comment on this at all? If these assertions are left unchecked, before you know it they’ll be taken as fact. I won’t be holding my breath for Gavin admitting he was wrong. Hahaha, don’t you just love how many memes can McIntyre put into one post? Plagiarism! Bristlecones! Climategate! Good! Humour is a good antidote to both cynicism and hubris. Point is, of course, that the signal for widespread, i.e. global, warming is still equivocal. Statisticians and modelers might see the signs, but the are not yet large enough or “global” enough for the average Joe to see. Recognizable trouble is still 10 years away – a little different from the Al Gore cinematic impression. Unfortunate: if you yell Fire! in a theater, the crowd expects at least a lot of smoke. I really like this quick-n-dirty summation, especially the spelling of geophysicists. Someone without a sense of humor is bound to tell you that you spelled that ALL WRONG, though. Could someone please explain to me how O’Donnell et al. is a refutation of Steig et al.? Reading Ryans’ comments and the paper’s abstract I do not get that impression at all. To me, this look s like science advancing and building upon and improving and earlier (and seminal) work. I bets this is how that paper came to be. SM: “Guys, we have to attack the “team” again”. SM faithful: “But how, oh wise master?”. SM:”How about we look into that Nature paper by Steig that is getting so much attention and showing inconvenient things?”. SM faithful “Oh master thou truly are wise”. So they start all filled with hope and glee that Eric et al. messed something up big time. Nope. OK, dig deeper, and deeper and deeper still…until, voila we found some issues that were not adequately or properly addressed the first time round! Phew, good, science and peer-review still work. Now the WUWT crowd will spin and milk this for all it is worth, and use it to make attack the integrity of Eric and his co-authors, and then extrapolate that to all those scientists involved in climate research. What scared me upon looking at some of the images is how much more warming they found over large portions of the WAIS (especially the Peninsula) than Steig et al. originally did. Yikes, things are not looking good for the PIG. I’m sure Anthony will ignore that fact. And look at that warming over parts of the EAIS…fortunately that warming does not seem to be statistically significant just yet. 1. To refute, especially by offering opposing evidence or arguments, as in a legal case. The implications for the West Antarctic Ice Sheet scare the carrots out of Eli, and with it sea level rise becomes more immediate and dire. Thanks for your responses Eric. I do give them credit for getting this published– I should have been clearer on that. From what I can tell, I have no reason to doubt the integrity of O’Donnell. In fact, until yesterday I did not know of him. I’m afraid though, that past actions clearly dictate that two of the paper’s co-authors do in fact lack integrity and do not necessarily have honest intentions in this debate. This is a good article and a great site. I have a comment regarding the public turning off or going to sleep over climate change. What do swine flu, bird flu, the ozone hole, resource depletion, and acid rain have in common? The are all science based issues with catastrophe threatened that turned out to be pretty moderate. The problem you have is the public look at this and look at climate change and conclude it will likely be the same. The fact that the ozone hole is disapperaring and acid rain caused less damage than feared was because we took action but this is lost on them. It will take another truly big temperature spike or something similar to wake them up Im afraid. Yes, and except for resource depletion, all those catastrophies were avoided in great part because effective action was taken to prevent a catastrophic outcome, and those actions were based on scientific grounds. Doesn’t that suggest you a proper course of action ? Hello ? Still, West Antarctica is definitely warming significantly, as Steig et al. found. That’s interesting. Not if all the warming is in the peninsula. That’s not as interesting as warming over the Ross Ice Shelf. I’m afraid though, that past actions clearly dictate that two of the paper’s co-authors do in fact lack integrity and do not necessarily have honest intentions in this debate. Sure… but the nice thing about the peer review regime is that it forces also basically dishonest persons to play straight, if they want to play at all. If the integrity of science depended on human nature alone, it wouldn’t exist. Scientists: Satellite data says Antarctica lost petatons of ice last year. Sceptics: Antarctica completely frozen today – no warming visible. Politics: Antarctica will not melt this legislative period. Media: Melting ice cubes do not disintegrate your cocktail. Public: Antarctica is last place on Earth for skiing. Why so casual about resource depletion? We passed Peak Oil in 2005 — new discoveries have NOT kept pace with use. That’s the definition of Peak Oil. Did people expect Mad Max the next day? Jeffrey: No. The definition of peak oil is the global peak in rate of oil extraction. It is not directly tied to rate of discovery. As Matt Simmons used to say in many presentations, peak oil is a “rear view mirror event”, in that we won’t know for sure we’ve passed it until several years after the fact. This is because the rate of oil extraction is so tied to other things like economic activity, public policy (e.g. encouraging alternatives), etc. Yearly worldwide consumption of petroleum passed discoveries in the early/mid 1980’s. We’ve been largely living off the ongoing production from the supergiant oil fields, like Ghawar in Saudi Arabia, for decades. This now completes our digression into peak oil issues. Carry on, everyone. Hey Eric, you spelled geofizzyzits ALL WRONG. Ah, I see, you already addressed that in post #5, where Peanut Butter and Gas (PBG) may have inadvertently bloviated. Sorry, I couldn’t resist the temptation. For some reason your graphic of the O’Donnell map is very different to the McIntyre one, which seems to show less warming. McI’s is also a lot smoother. Just wondering where your version comes from? And I wasn’t saying otherwise. Look forward to your further post on it. Maple Leaf @ 8 – Why would you feel that 2 of the authors lack integrity? Did they not publish what the facts spoke to them? If they lacked integrity, they would have tried to bamboozle this study to their opinions. It appears to me that all 4 authors had the integrity to publish what their results stated. If you take a breath and relax a second, you may realize that this is exactly what has been a thorn in the debate. The scientists have to play by the peer review rules, somewhat handcuffed, the bloggers do not. Well in this case the bloggers got together and played by the scientists rules. We should be celebrating this for a few moments, then let the process continue, with rebuttal and comment and hopefully more peer reviewed publishing by scientists and bloggers all. This is what will eventually break the log jam, and maybe allow the politicos to proceed with knowledgable legislation. “It is my understanding that the reconstruction methodology/technique is designed to estimate temperatures using the satellite data, so the image should be high resolution, with the temperature data having the same resolution the satellite data/pixels. The AVHRR satellite data from the NOAA satellites are fairly high resolution, although I am not sure exactly what; 1-km comes to mind. Anyhow, the RC graph makes more sense, as the detail is consistent with the satellite data used to generate it. Smoothing the data potentially removes valuable information. Thanks again for your feedback. Not to harp on this, but you seem to have misunderstood my post. I was not suggesting that you were smoothing the data or not displaying it correctly. IMHO, your reproduction (“RC” above) is the appropriate way to display the data. I was taking issue with the fact that others are smoothing (or overly smoothing) the data, and as a result, information may be being lost. That is all. Wonderful Eric, it’s nearly 2 a.m. here in Brazil, and I am waking the neighbors I am laughing so hard. ‘course, they already think I’m some kind of crazy American, so it doesn’t matter. Thanks, for posting this Dr. Steig. I think if you pressed the authors on the issue (pers comm) they would not put too much confidence in that particular splotch. But that will be an interesting conversation. Looking forward to it. I havent seen Ryan’s code, but if he did stuff in R I’d be willing to donate some time to put it into a proper R package. So, speaking for “the public” : can anybody clearly tell me whether the current data on Antarctic say anything about the anthropic origin of global temperature changes, or not ? Ryan’o, Jeff ID etc… just like to see stats done well at the end of the day. When they see a novel (or unusual) approach it sets off alarm bells – as it should. Plus the Steig graphic on the cover off Nature looked odd, particularly when compared with weather stations and previous work. Whilst many of the conclusions remain the same, the overall trend is reduced and greater resolution captured. I dont see any issue with that for anyone, as I have often heard people claim Antarctica should be cooling, based on GCM results. The work they have done should set the bar for such studies and engagement with them would be of benefit to everyone. They have done what any good engineer is trained to do, look at everything with a critical eye and ask “could we do that better”. Its unfortunate in my opinion that the stats community is not engaged more and that the peer review process did not identify that better results could be achieved with a few tweaks of the methodology. Also the warming for the continent is within the error bars so I wouldn’t say more then that Antarctica might be warming. One further note this whole article is way off since the press gladly shouts out any claim about globalwarming. If you think you got the press against you I dont know what press you read, but it certainly ain’t Swedish press. I think the warming along the peninsula is an exaggeration caused by the calculation method. Given that the O’Donnell improvement to your original work shows a much smaller (0.06) warming, this no longer presumably “matches” the warming of the southern hemisphere. A contradiction remains, and given your acknowledgement at #27 above that the jury is still out, would you be gracious enough to concede that announcing the death of an annoying mis-match between southern hemisphere warming and Antarctic warming was premature? What warming at the margin of the continent (which is stronger in the O’Donnell paper) is important is for sea level rise, not only from melting but also from weakening of the ice sheet at the discharge point and speeding up of discharge into the oceans. However, as Sarcasto would say, this is all to the good as dilution will decrease the effect of adding additional CO2 to the atmosphere on ocean acidification. Eric, since you have both sets of data, it would really help if you provided maps plotted on the same temperature scale and also maps with mean summer temperatures in the coastal regions rather than anomalies re the melting/weakening/acceleration of discharge issues, since as glaciologists should say, that is where the ice meets the water. I’ve been away from a computer for about four weeks and now want to catch up on the most current thinking re the WAIS. Any suggestions on how I can do this? Alex: No, that is peer review you are talking about. The warmist international controls all journals and can make papers (maybe even people) disappear! Don’t take it from me, that is what has been reported on the internet. There’s some great social commentary here. I also have to say I love any blog that employs the term, “Phizzicists”. Not to be pedantic, but your implication that we included a portion of West Antarctica in the Peninsula is not correct. Our Peninsula mask accurately reflects the official definition of the Peninsula by the US Geological Survey, and includes less of Ellsworth Land than most rule-of-thumb definitions (i.e., land northward of 75S). Rather, I would submit that the definition used in your paper (land northward of 72S) is the outlier. Alex and Rocco, I don’t know why none of the moderators have asked this, but please stop with the conspiracy theories. These discussions are for science, questions and answers, and reasoned argument. “Reported on the internet” doesn’t cut it – lots of things get reported on the internet that have nothing to do with reality. One other small clarification . . . the reason that Eric’s plot at the top of the page appears to show more warming is due merely to choice of temperature scale and coloration. The scale Eric chose (-0.4 to +0.4) is different from what we used in the paper (-0.6 to 0.6) and the coloration scheme is different as well. The colors we chose were such that the transition between light yellow and orange roughly correspond to statistically significant trends. … Don’t take it from me, that is what has been reported on the internet. Boy howdy, you sure know it. Why, you can find canned unicorn meat on the Internet. You can learn how Obama is Socia-list, fasc-ist, not an American citizen who is out to destroy if not the world at least the US. Rachel Maddow is a les-bian vam-pire. The list goes on…. For an entertaining video on fact-checking, point your browser at http://www.youtube.com/watch?v=yBxzMMCokpI and enjoy. Maya, I rather suspect Rocco was being sarcastic. Beautiful! Love a good laugh any day. I totally agree but I said all that in my post, please actually read it right thru. Ooh, my bad. I’m too quick to assume people have … themselves in interesting anatomical positions … rather than simply tongue in cheek. At the link, Steig and Co.’s map is from +0.5 to -0.4 which is pretty close to the map at the top of this post. What Eli would say to both of you is that best practice is to set the scale so all of the colors in a false color map are used consistent with not changing scales between instances. Where is the paper itself? I thought it was supposed to come out on the 7th? JOC website does not show it. Has anyone looked at what portion of the continent has statistically meaningful warming, versus statistical meaningful cooling? If I recall, the decadal trends are accurate to roughly +/-0.1 deg C.
It appears from the maps at the Eli Rabett link, that O’Donnell found statistically meaningful warming in about 30% of East Antarctica, with less than 5% showing meaningful cooling. The previous paper by Steig had far less resolution, and showed less than 5% of East Antarctica showing meaningful warming (with the rest of the area not showing any meaningful warming or cooling trends). 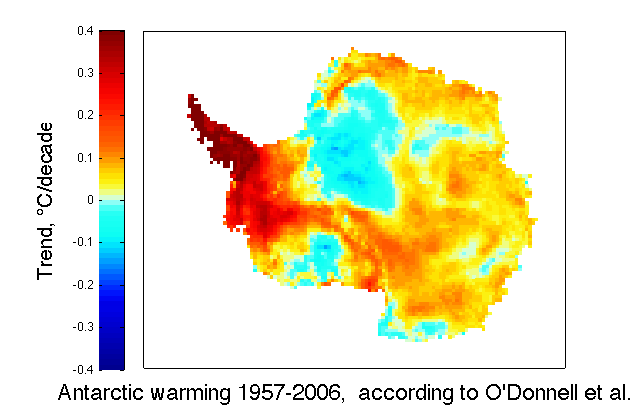 In West Antarctica, both the O’Donnell paper and previous work by Steig show statistical warming over 70% of the area, but the O’Donnell paper shows much warmer anomalies across much of West Antarctica, particularly the Antarctic Peninsula. O’Donnell shows most of the Peninsula warming over 0.4 deg C per decade. A new paper published in the highly regarded Journal of Climate shows statistically significant warming in over 70% of West Antarctica, consistent with a previous study. However, the new study shows much higher warming throughout the Antarctic Peninsula than the previous work showed. West Antarctica has some of the most threatened ice sheets, glaciers, and ice shelves on the continent. The new study also shows significant warming over 30% of the much larger East Antarctica ice sheet, whereas previous studies showed no statistically significant warming. In contrast, less than 5% of East Antarctica showed significant cooling, inconsistent with some forecasts expecting significant cooling due to effects from the ozone hole over the South Pole. Is this a reasonable summary of the new results? Would the two groups of authors be willing and able to do a better, more comparable set of maps? — Maps drawing isobars (contour lines) would be much easier to understand and compare. — A map showing the differences between the two maps could help. I realize the maps don’t convey uncertainty.